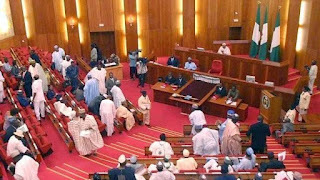 Some senators on Wednesday faulted the North East Development Commission for excluding Kano and Plateau states, among other reasons. President Muhammadu Buhari last week assented to the Act for establishment of the commission. On Wednesday, a motion sponsored by Danjuma Goje, Yobe-APC, urged the Senate to commend the president for assenting to the Act. However, some senators took turns in criticising the commission for excluding the two states they noted were also strongly affected by the Boko Haram crisis. Mr. Goje was absent at the plenary due to the death of his wife. The motion was presented on his behalf by Senate Leader, Ahmed Lawan. Presenting the motion, Mr. Lawan noted that the commission was established to receive and manage funds allocated by the federal government and international donors. He said it will coordinate projects and programmes within the master plan for rehabilitation, resettlement and reconstruction of the North East. But following the presentation of the motion, senators expressed criticism of the composition of beneficiary states and alleged government insensitivity to other regions. Kabir Marafa, Zamfara-APC, said the rehabilitation of the insurgency-ravaged North-east region does not require a permanent commission. He argued that every part of the country needs development. “I am one of the few people that opposed this bill during the second reading because I believe that is not the way to go about it in the first place. I believed that time that the region requires an ad-hoc arrangement that will solve the problems caused by the war of Boko Haram, not a permanent structure that will bring about infrastructure that will take away all necessary money,” he said. “My second reason was that there was no justice in the bill because Kano, Plateau and even some parts of the FCT suffered consequences of Boko Haram and we felt they must be included. In the thinking of this chamber, we included Kano and Plateau but as it came out of the committee, Kano and Plateau were shut out. In his contribution, Ben Bruce, Bayelsa-PDP, warned against the use of funds accruable to the commission for running overhead expenditures rather than in providing infrastructure. He said: “When we set up these commissions, a great part of the budget is spent on overhead. If you go to the offices, it’s like a market place. Even though I voted for this bill, it makes me wonder whether the money should go to the state government to run the affairs. Maybe the state government should have these extra funds rather than setting up a commission. I’m beginning to wonder if I voted rightly in voting for the bill. James Manager, Delta-PDP, was specific about the problem of road construction in the South-east, which he urged the Senate to work on. “There is the South-east development bill that came to this Senate and it received over 85% support. I have travelled almost all the South-east and all the federal roads are in bad state. Entering the states has been very tedious. Mr. President, my respected colleagues, that region needs urgent attention. All the federal roads have collapsed. The South-east development bill must be worked upon,” he said. Similarly, Sam Anyanwu, Imo-PDP, urged other senators to support similar bills from other zones when they surface. The Senate however rejected additional resolution that whenever an amendment is to be made to the bill, in future, Kano and Plateau states should be included.